What are Open Online Courses? Why Take an Open Online Course? Open online courses provide public access to learning materials, usually organized in an academic format with components like lectures, readings, assignments, discussions and quizzes. The format encourages knowledge sharing among participants who may enter with different levels of experience and skill. Many of these courses are also free to access online, although students may be required to pay a fee for a completion certificate or an evaluation of overall learning by exam. Some open classes also require students to register or enroll, even though they don't have to pay or subscribe. MIT was one of the first schools to move forward with a large-scale open courseware initiative. Starting with just 50 courses in 2002, this program now includes more than available 2,250 courses. Today, MIT is just one of more than 400 schools offering open online education with goals related to connecting students and faculty members globally. As of 2014, more than 16 million students were enrolled in courses offered by the top five open learning platforms. And these learners aren't all located in the U.S. MiriadaX, offering open courses from Latin American institutions, serves more than one million learners, and the UK's FutureLearn platform reaches more than 800,000. The Open Education Consortium maintains a directory of open courses and works to support and expand the open education movement. Learning online can take many forms, including structured courses. Free courses are offered in different formats by a wide range of schools and sponsors. Before signing up for a free class online, take some time to compare multiple available options. Do you want to enroll in something that is completely self-paced, or do you need deadlines to stay on track? Do you want to study alone or have connections with classmates and instructors? There are also special considerations to bear in mind when comparing online classes. While most open courses are free to access, if you want to earn transfer credits or a certificate of completion, you may have to pay a fee. Know what to expect before you enroll. Massive Open Online Courses (MOOCs): The term MOOC can be traced back to 2008 when it was used to describe an online course offered by the University of Manitoba that was opened to the public for free with no limit on class size. More than 2,000 people enrolled and the goal was to foster connections among these participants. 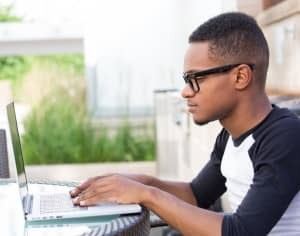 These MOOCs became known as cMOOCs to differentiate them from classes offered by newer education platforms like Coursera and edX, which are often referred to as xMOOCs. In general, the courses are heavily focused on student interaction with course content. OpenCourseWare and Open Courses: MIT published its first online courses in 2002. This initiative became MIT OpenCourseWare, which continues today with faculty sharing course materials ranging from notes and syllabi to video lectures and interactions for more than 2,250 classes. Anyone can access these materials and use them on their own or as supplemental resources. The Open Education Consortium catalogues open courses from MIT and other universities in the world. Tuition-free Programs: The University of the People is a nonprofit, accredited university that offers free access to undergraduate study online with support from corporate and education partners. Some campus-based universities, like Berea College and Deep Springs College, don't charge tuition, but put students to work at school facilities. Open Education Platforms: Private online education platforms such as StraighterLine combine some of the strategies already described in this list. They offer free access to course materials and no enrollment caps, but may charge to test your learning. Some of these platforms also feature academic accreditation and assistance with the transfer credit process for those who want their open course completions to count toward degree requirements at other universities. Many of these courses and certificate programs, like Udacity's Nanodegrees, are designed to develop work and career related skills. How do open online courses work? Content and Course Structure: Some open courses mirror a traditional college course format, providing a detailed syllabus, assignments with strict due dates, participation requirements and weekly lectures. Other courses are more loosely structured, allowing learners to review content (e.g., videos, articles, practice exercises) at their own pace, with little or no interaction with classmates or instructors. Open online courses typically require you to register or sign-up for access through an online form. Certificates: Many open online courses are designed with skill development in mind. For students who want to learn a job or career-related topic, open courses provide the learning materials and an assessment of learning achievement. Some classes provide a certificate of completion or a certificate of mastery for those who score highly on exams, which may require a fee. Academic Credit: Other open online courses are designed with college degrees in mind, and are offered by platforms that partner with traditional universities. These courses have been reviewed and recommended for credit by an organization like American Council on Education (ACE), and in some cases are approved for credit by an accrediting agency. Keep in mind that a college may or may not accept these credits toward a degree program. These courses usually have a fee for exams and transcripts. School-sponsored open programs, like Arizona State University's Global Freshman Academy, offer encouragement to complete introductory courses in a MOOC format at reduced costs. Professional Credentials: Udacity's nanodegree programs offer learners the opportunity to develop technical skills through completion of a multi-course series. Through fee-based options, students earn a new kind of credential that documents their learning and skill development. A new pilot program from MIT promises to combine MOOCs and traditional classes as a low-cost way for students to earn a master's degree in logistics. Completing the MOOC portion of the program will result in a MicroMaster credential. Traditional colleges and universities have realized the reach and importance of open online courses. Many of these top schools are leading the way for higher education innovation through their campus-based, online and open education offerings. While several schools provide open materials through their own websites and platforms, others are partnering with consortiums of colleges and learning platforms to broaden access to their courses and instructors. This list includes schools that have made concerted efforts to advance and build their online course offerings. Join a course study group through OpenStudy. MIT has a goal of publishing all course material online. Offers free and low-cost online courses with options to earn academic credit. Open online courses are offered through multiple platforms, including Stanford OpenEdX, Coursera and NovoEd. Open online courses are offered through Udacity and Coursera. Offers a MOOC-based Master of Science in Computer Science. Students can complete their freshman year through open online courses offered via the Global Freshman Academy on edX. Other open courses also offered through Coursera. Free online classes are offered on Coursera and edX. Open Yale Courses include materials that have Creative Commons licenses for non-commercial re-use. Course lectures were recorded in Yale classrooms. The Online Learning Initiative collects and analyzes data from student use to continually improve the courses. Some of Duke's open online classes are also eligible for Continuing Education Units. Local students can participate in hybrid options. UWM offers open online courses through a MOOC program and Coursera. Intro to Artificial Intelligence: Created by Stanford University for Udacity, this course will take approximately four months to complete, but you can work at your own pace. You can access the course videos and practice exercises for free. To work with a student coach or get a completion certificate, you'll need to sign up for the monthly subscription after a 14-day trial. Machine Learning: Explore "the sciences of getting computers to act without being explicitly programmed," in this course from Stanford University offered through Coursera. This course is offered in a structured format with start and end dates over an 11-week period. Complete the graded assignments and quizzes to earn a course certificate. Become an iOS Developer from Scratch: This Udemy course provides free access to video lectures and step-by-step instructions to develop a fully functioning iPhone or iPad app. The format is self-paced with video tutorials, practice exercises and a discussion forum. Introduction to Algebra: If you need a review of math before returning to college, the interactive components of this open course in edX offer a good place to start. This self-paced course is free to access and also serves as a high school Advanced Placement test prep resource. Statistics – The Science of Decisions: Many students struggle with statistics courses, which are required for a wide range of majors from math to nursing. Udacity's open course from San Jose State University includes video tutorials and practice exercises in a self-paced format. Introduction to Complexity: Through a platform offered by the Santa Fe Institute, you can view the archives of this free course or sign up for the next session. Learn about topics ranging from chaos theory and fractals to modeling and networks. The Portland State University instructors provide video lectures, guided discussions and downloadable resources. Initiating and Planning Projects: This six-week, self-paced class focuses on project stakeholders, scope and project manager responsibilities. Offered by the University of California, Irvine, this course is part of a four-course project management specialization series from Coursera. For a fee, you can earn a certificate through course completion and a capstone project. Make a Marketing Plan: The University of Cambridge provides this open online course through the Digital Business Academy platform. Complete the materials and practical exercises in approximately 15 hours to learn more about marketing strategies, customer segmentation, buying decisions and competition analysis. Rethinking Teaching – Redesigning Learning: Explore the latest trends in teaching through the hands-on activities in this Open Learning course. The self-paced format includes 12 modules designed to help teachers meet "the growing challenges of preparing our students to function in tomorrow's world." Get Organized – How to be a Together Teacher: This Coursera course includes 8 weeks of self-paced materials. Through videos, readings and projects you'll explore planning techniques and effective time management practices. Blended Learning with edX: For teachers interested in blended education trends, this course provides examples and tips for incorporating edX materials in a blended class. This course is free and should take 3 to 4 hours to complete. Shakespeare and His World: Future Learn offers this free online course from the University of Warwick. Explore not only the cultural themes of William Shakespeare's plays, but also his life and influences. The content is presented in 10-weekly sessions that include videos and digital archives. The Conscious Mind – A Philosophical Road Trip: Enroll in this free 4-week course to "explore the words of sense, thought and the mind through the philosophical discipline of phenomenology." Offered by Trinity College on the edX platform, theory and practice are combined through readings and reflective exercises. The Modern World, Part One – Global History from 1760 to 1910: Explore the political, economical and sociological changes during this historic period of innovation and transformation. Video lectures and quizzes are available throughout this seven -week course from the University of Virginia and Coursera. World of Wine – From Grape to Glass: This class from edX and The University of Adelaide gives students a background in "the principles and practices of how grapes are grown and wine is made." Issues related to sustainability, vineyard management and wine tasting are also addressed. Easy Singing Techniques for Adult Beginners: Offered on the Udemy platform, this free course covers topics ranging from correct singing posture to breathing techniques. A series of videos help you develop a regular routine for practice and increased confidence. A Life of Happiness and Fulfillment: This Coursera course helps students explore the concept of happiness in psychology, philosophy and neuroscience. Guest lectures from many of the most popular authors and scientists in the field are presented along with practical exercises. If you are interested in open learning online, there are additional resources to help you find the most relevant options. This section of the guide pulls together opportunities from across the Web, including full-course platforms, mobile apps, audio podcasts and video series. Open online course platforms provide convenient access to all of the components of an online course, such as video lectures and discussion boards. These sites also coordinate registration and issue certificates where available. Learning platforms are typically managed by private or nonprofit organizations, but may partner with specific universities. edX: Students can choose from multiple formats (e.g., self-paced, instructor-led) and pursue more than 650 course topics ranging from architecture to medicine. Instructor-signed certificates of completion are available for a fee. Students interested in developing more advanced skills can pursue an XSeries program consisting of multiple classes. Major partners include MIT, Harvard, The University of Texas System and Arizona State University. Canvas Network: Schools and individual instructors can offer free online courses through the Canvas Learning Management System's Canvas Network platform. In addition to academic course titles, workforce learning topics are also offered. Most classes have start and end dates. Coursera: Providing access to more than 1,700 classes offered through 138 partners, the Coursera platform was one of the early options in open online education. Partner institutions include Rutgers, National Geographic, Brown University and the University of Michigan. Completion certificates are available for a fee. Students can also choose to complete multiple courses in a specialization, which also required a capstone project and a fee. FutureLearn: Managed by The Open University (UK), FutureLearn has more than 80 educational partners including universities, government agencies and museums. Search for an online course by category (e.g., history, creative arts and media, teaching and studying), or collection to learn more about a topic. Certificates of Participation are available for a fee. Udacity: With a focus on developing technical skills, Udacity offers online courses and nanodegree programs in areas such as data analysis, programming and web development. Some courses are free to access, but others offer a trial followed by a monthly subscription. Udemy: Offering paid and free online learning opportunities, this platform boasts more than 40,000 courses taught by more than 20,000 instructors. Udemy encourages individuals to design and develop courses that help them share their expertise. Search for classes on many topics. GroupMOOC: Two of the challenges of open online courses are keeping track of course requirements and connecting with other students. This app is designed to help you organize class deadlines across platforms and build a network of friends who are also studying online. This app is free to download and is available for iOS. MOOC Providers: Use this app to search for open online courses offered by Coursera, edX, Udacity, Udemy and FutureLearn. Recent updates include arabic, English, French and Spanish language options. MOOC Providers is available on Android. EDUCAUSE: Search the EDUCAUSE Library for podcasts about open education and discover interviews with thought leaders in the field, as well as news about MOOCs and learning platforms. This nonprofit organization serves information technology professionals in higher education. TEDTalks: You can review this popular presentation series through its audio podcast option. New talks are added weekly covering a wide range of education, business, science, health and social topics. iTunes: Search the iTunes library for access to audio and video recordings. These podcasts address all levels of education and training, providing access to both learning materials and education news. University of Oxford: This collection provides open license access to thousands of lectures online. Audio and video formats are available, and the topics range from English literature and business to medicine and digital humanities. Khan Academy: View videos and practice activities through the Khan Academy's free website. Sign up with your email address and explore content in general education topics (e.g., math, science, arts and humanities) as well as computing and test prep. YouTube EDU: Subscribe to this channel for interviews, how-to tutorials, language learning and more. Search for a topic of interest or choose a grade level (e.g., primary and secondary, university, lifelong learning). MITvideo: This site pulls together videos produced by all of MIT's offices and departments. Check out featured "spotlight" presentations or search the library of more than 12,000 videos by topic. Boston College Front Row: Browse more than 1,000 recorded academic lectures and cultural presentations from across the Boston College Campus. Open Education Consortium: A nonprofit organization comprised of a global network of educational institutions and organizations. What is a MOOC? : A video explanation from EDUCAUSE and links to other relevant resources in this organization's online library. MOOC-List: Search for open online courses offered by language, school, platform or instructor. What is OER? : More information about open educational resources and the Creative Commons open licensing system. Open Education Week: Coordinated by the Open Education Consortium, this annual event highlights trends in the industry through a series of events and social media sharing. MOOCs and Open Courses – What's the Difference? : Basic terminology related to open learning is explained in this article from JISC. Senior citizens are returning to college to earn or finish degrees, to advance careers, and to learn new things. Public libraries offer endless resources and services for online students! You can take advantage of these opportunities, even if you’re not on campus. Plagiarism can be easily be avoided with the right citations. Knowing when and how to use them is the tricky part.